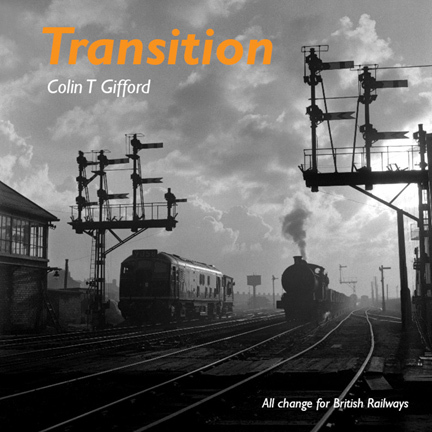 To coincide with the 50th anniversary of the last regular steam working on British Railways, Colin Gifford's latest book called 'Transition' will be published. The book concentrates on the period from the late 1950s to the end of steam traction on British Railways in August 1968 and Colin has captured on camera this changing scene where diesel and electric traction was being increasingly used at the expense of the steam locomotive. Colin's pictures of this transition period are taken in his usual evocative, atmospheric and artistic style. The book contains 180 pages and 257 photographs nearly all of which show more than one form of motive power, but always with steam to be seen somewhere on the image. It is a hard back book with a dust jacket. The cost is £30 plus postage. The latest positive news to relate is that there is now a definite date for the publication of this book. It is not quite as soon as we would have liked but the completed print-run, bound and delivered will be in stock here on May 2nd. As this will be a Thursday, and it is Bank Holiday weekend two days later, it is anticipated at this stage that the pre-ordered books will be sent out during the week commencing May 6th. We are also looking at a special event to have Colin Gifford here for those who wish to meet him and for him to sign books for any further sales. The date for this new launch is provisionally Sunday 19th May. The reason behind this is that it is 'Mixed Traction Day' on the SVR and there will be an intensive service of trains using both steam and diesel locomotives. This is perhaps the nearest we can get to the transition period which of course is the subject of the book. Further details as to purchasing the book will appear here over the next couple of weeks, including on-line purchasing and retail outlets. The positive news to relate is that March 2019 is the month when the book finally gets printed. Some of the running sheets were received on 13th February and the quality of the print was just what we had hoped for, so our confidence is high that the rest of the book will now be printed to our exacting standards. Currently pdfs are being completed for the remainder of the book and will be with the printer before the end of this week. The actual print schedule will then become available and will be posted on this site. Arrangements have been made for us to see the remaining running sheets off the end of the press and this will provide an extra layer of quality control now that we have hopefully solved all the technical problems. So as we finally reach the finishing straight with hopefully no more hurdles to overcome, the updates will become more frequent as we post positive dates for each of the stages in the process. The actual dates will become clearer over the next couple of weeks as we progress each stage. Once we know an exact delivery date (now to be counted in weeks rather than months! ), then we will try and organise another launch of the book, maybe to coincide with one of the events on the SVR. We very much regret the delays in the production of this book but hopefully we can appreciate that when it finally does arrive, it will be a fitting example of the work of one our finest railway photographers in Colin Gifford. Firstly once again a very big thank you to you all for being so patient for so long and for the countless messages of good will and support we have received from you all, as we continue to ensure we bring you a top quality product for you to savour and to indeed do justice to Colin Gifford's artistic craftmanship. I have shared many of your comments with Colin and he has told me he has been humbled by your response and wants nothing but the very best for his loyal readership. The previous update mentioned that I was awaiting some more running sheets which were specified to match the proofs which I had approved rather than repeat the exercise of producing sheets which did not match the proofs. Those new running sheets took a bit longer than promised to come, but the positive news about them is that they almost came up to our expectations, and there was a definite rich black taking the place of the more brown colour previously supplied. If you were to ask on percentages, I would say we are 90-95% towards producing a really good book with the intensity of black I have been looking for since we started. Unfortunately the Christmas holiday has now halted further progress for a couple of weeks, but I am seriously hoping that this time is really 'third time lucky'. I am currently looking to specify a slightly different ink so as to bring the best out of the lighter tones, and when we have seen the results of that I am sure that we will be able to give the go-ahead for what hopefully is the final time! As far as timing goes, we have, much to my disappointment and no doubt yours, missed giving you something to read at Christmas and for which I am truly sorry. As you know the whole world seems to shut down for some time over Christmas and I do not expect further sheets to be available until the first week or so of the New Year. However, once I am satisfied that all our expectations will be met, I would hope that we will see a finished book being dispatched before the end of January. Until I receive the latest sheets in the first week or so of January I am not able to give a firm date for publication, but I would be disappointed if we do not see the book appear before the end of that month. Certainly the most recent advances are very encouraging. First of all a big thank you to you all – firstly for being patient for so long, and secondly for the many messages of support I have had from you as we try and ensure top quality and to make this Colin Gifford book something special. After all the trials we have done over the last few weeks, we have finally reached a stage where we have had proofs which look really good. As long as we can match those proofs on the press, then we will end up with a superb book, and we shall know that within the next few days as the book rolls off the presses. I cannot imagine that we will have any more delays as everyone has made the effort to get it right. The date for delivery has been given as 5th December and we will be busy dispatching them as soon after as possible to those who have pre-ordered the book. If you wish to pre-order the book, then please email us on krm@krm.org.uk and we will send you an order form. The offer is that if you pre-order and we receive payment before the end of November, then we will send you the book post free (UK only). After the end of November any fresh orders will be subject to a post and packing charge. For those of you who would rather buy your books at a retail outlet, the ISBN number of the book is 978 1 9164001 0 8, but that number will not appear on the retail lists for a few days yet. The number of retail outlets will be fairly small, but will include both Ian Allan bookshops. Further updates will appear as the book goes through its printing and binding process.